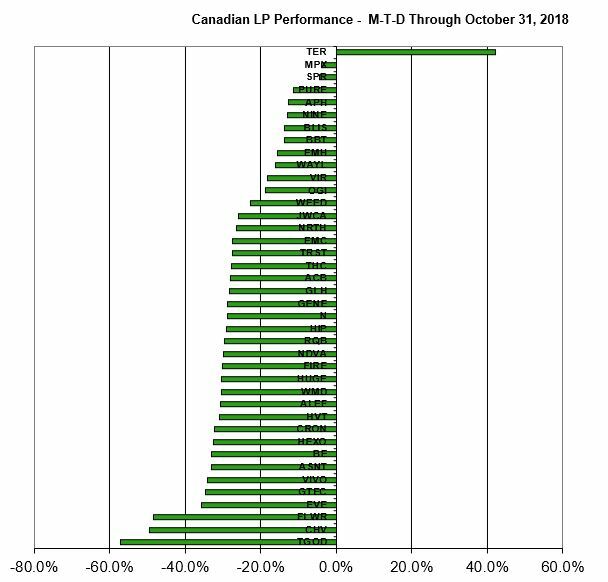 After extending upon September’s spectacular gains of 22.6% into mid-month and testing the highs from early 2018, the Canadian Cannabis LP Index sank 25.1% in October to 939.04. Supply of stock was a big story during the month, with Green Organic Dutchman (TSX: TGOD) (OTC: TGODF) raising C$75 million by selling Units at C$6.85, Tilray (NASDAQ: TLRY), which isn’t in the index, selling $475 million in convertible notes, Wayland Group (CSE: WAYL) (OTC: MRRCF) raising C$50 million selling units, Supreme Cannabis (TSXV: FIRE) (OTC: SPRWF) issuing C$100 million in convertible notes and Namaste Technologies (TSXV: N) (OTC: NXTTF) selling almost C$52 million Units at C$3.00. Aurora Cannabis (TSX: ACB) (NYSE: ACB) uplisted from the OTC in the U.S., while Aphria (TSX: APH) (OTC: APHQF) announced it will do so on November 2nd, when it begins trading as “APHA” on the NYSE. It will also change its TSX symbol to “APHA”. Canopy Growth announced the acquisition of intellectual property from Colorado-based ebbu. Health Canada issued 12 licenses during the month, leaving the total at 132. Several of these were awarded to publicly-traded companies. 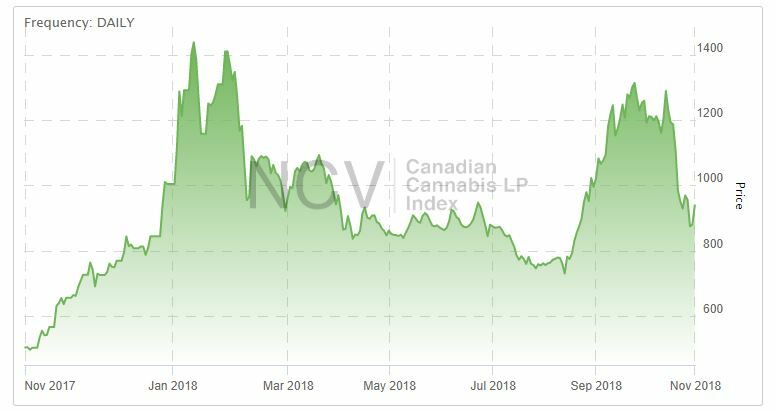 The index, which included 40 publicly-traded licensed producers that traded in Canada at the end of September, with equal weighting, is rebalanced monthly. Each of the members is also included in a sub-index, with four in the Canadian Cannabis LP Tier 1 Index twenty-seven in the Canadian Cannabis LP Tier 2 Index and nine in the Canadian Cannabis LP Tier 3 Index during the month. Tier 1, which includes the LPs that are generating sales of at least C$4 million per quarter, fell 22.8% in October and is now up 35.9% year-to-date. This group included Aphria, Aurora Cannabis, CannTrust (TSX: TRST) (OTC: CNTTF) and Canopy Growth. Within the group, Aphria had the best return at -12.8%, though its -16.0% return is the lowest among the four year-to-date. Canopy Growth’s 62.8% year-to-date return leads the group. Tier 2, which includes the remaining LPs that are permitted to generate sales, declined 26.0% and is now down 16.3% year-to-date. TerrAscend (CSE: TER) (OTC: TRSSF) posted a return of 42.2% after it announced its intention to commence operations in the U.S. Green Organic Dutchman declined 57.0%, with substantial insider selling ahead of lock-up expirations for investors prior to the IPO on November 2nd. Aurora Cannabis was also a seller of the stock after declining to exercise an option to buy shares at a 10% discount. Recent new issue The Flowr Corp (TSXV: FLWR) (OTC: FLWPF) fell more than 40%. Tier 3, which includes the LPs that are licensed to cultivate but not yet approved to sell, fell 23.7% and is now up 2.2% year-to-date. The best performer from this group was MPX Bioceutical (CSE: MPX) (OTC: MPXEF), which declined 4.0% and received a stock-based acquisition offer for its U.S. assets from iAnthus Capital (CSE: IAN) (OTC: ITHUF). Canada House Wellness (CSE: CHV) (OTC: SARSF) performed the worst among the group with its 49.4% decline. 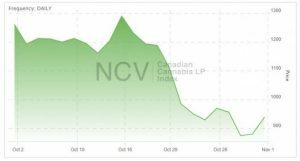 For November, the overall index had five additions, including Biome Grow (CSE: BIO) (OTC: ORTFD), Choom (CSE: CHOO) (OTC: CHOOF), Heritage Cannabis (CSE: CANN) (OTC: HERTF), MediPharm Labs (TSXV: LABS) (OTC: MLCPF) and Valens GroWorks (CSE: VGW) (OTC: MYMSF), all of which has been added to Tier 3. Readers should be aware that Tilray, with no Canadian listing, is not eligible for inclusion in the index, which is denominated in Canadian dollars. In the next monthly review, we will summarize the performance for November and discuss any additions or deletions. Be sure to bookmark the pages to stay current on LP stock price movements within the day or from day-to-day.